I made my cookbook PV at YouTube Space Tokyo!!! 1. Beat eggs in a bowl, season with ground pepper, and mix well. 2. Cut bacon strips and sliced cheese into halves, and make pairs. 3. Heat olive oil in a Tamagoyaki Nabe (rectangular omelet pan), pour 1/5 of egg mixture in the pan and spread over the surface. Cook until half done then place one piece of bacon and cheese on top of each other towards the end closest to you. Roll up the egg and move it to one end. Pour in another 1/5 of egg mixture and let it flow under the rolled egg also. Cook until half done and again place bacon and cheese on the egg and roll up the egg again. Repeat this until all your ingredients are gone. 4. Allow it to cool and cut it into 6 pieces. Also cut the grape tomato into 6 wedges. 5. 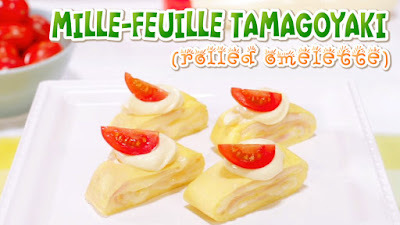 Garnish with mayonnaise shaped to look like whipped cream and put a grape tomato wedge on top to look like a strawberry.